According to BBC News (via The Wrap), the Chinese government is blocking all mentions of Winnie The Pooh on social media sites in an attempt to stop people from associating President Xi Jinping with the cubby, honey-living children’s character. 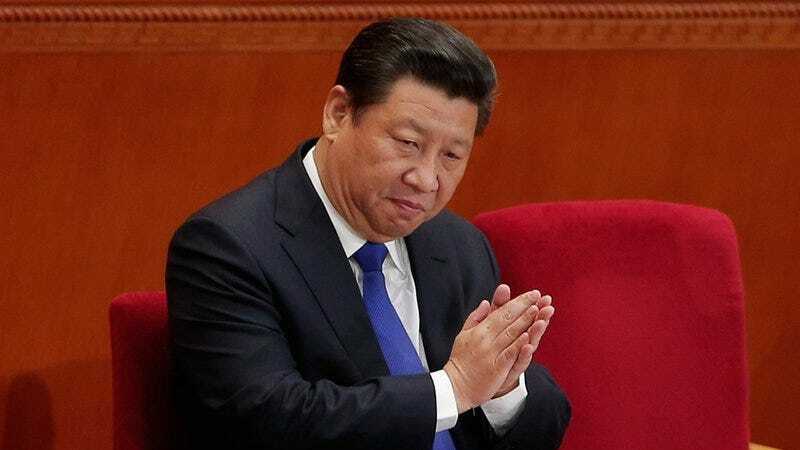 Apparently, Winnie The Pooh has been the go-to reference for people looking to poke fun at President Xi for a while now, but the government is ramping up its censorship operations in advance of the Communist Party Congress this fall so that President Xi can make a big show of his “grip on power”—as the BBC puts it—and try to shut down his critics. As for why people used Winnie The Pooh in the first place, the BBC story doesn’t really get into it, but it suggests that replacing the president with a silly figure like the cartoon bear is a straightforward attempt to undermine the assertion that he’s superior to the rest of the population in some way. Whatever the reason, uses of Pooh’s name in Chinese are blocked on the country’s omnipresent WeChat app, and attempts to look up previously accessible Winnie The Pooh images now turn up nothing. For Cheetos’ sake, we just hope Donald Trump doesn’t hear about this and steal the idea to ban things that people use to make fun of him.